It has been a long-standing tradition at Juicy Results to ask new team members to summarize their first couple of weeks as a Juicer. Here are the thoughts from our newest Internet Marketing Coordinator. The journey from a data analytics background to finding my place in the world of marketing was one that was a hopscotch act from one soft stone to another. It started with consulting side work on friends’ websites and social media accounts to part- and full-time project work for a variety of companies. But, I was falling short of my big break. I wanted an opportunity to have my natural marketing talents not only recognized, but also nurtured. In the spring of 2016, I had my dreams realized by joining Juicy Results as their Internet Marketing Coordinator, and these first couple of weeks have solidified that I made a great choice! Finding the right environment for me to complete “curving my cube” (as I like to say) had a lot to do with finding a company with the right leader and culture to match my out-of-the-box nature. I’ve never quite fit in with a stuffy, clock-in/clock-out, eyes-over-my-shoulder workplace; I’m entirely too self-motivated and creative for that. So, when I first found out about this position and browsed the company’s website, I was hooked. Jeremy has dedicated a lot of focus on the Juicy Results culture, and it was evident not only from the unique aspects of the interview process (find out for yourself! ), but also from day one forward. 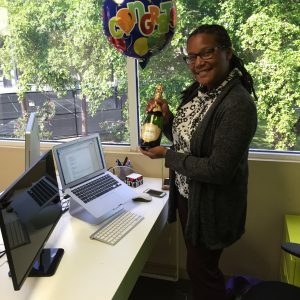 I walked in on my first day to a congratulatory balloon and bottle of champagne. I mean, who does that?? And, there to greet me was not only Jeremy, but also his dog (ahem, I mean the receptionist), Jackson. Jeremy has strived to create a very comfortable work environment and succeeded!! My learning that day and the first few that followed was focused not only on the company culture and the values, but also on some real “bootstraps” work. Jeremy had me write a press release, sit in on conference calls with clients, take over a key client’s Twitter account, write and review articles, learn to take over Juicy’s Copilot program, and generate some client creatives. Through these types of assignments, I can honestly compare my first couple of weeks here at Juicy Results to a crash course in SEO! Some of my favorite moments, however, have been my coffee sessions with Jeremy discussing his book, The Bootstrapper’s Guide to Search Engine Optimization. Truly, I tell you, this book is chock-full of juicy bits and nuggets of SEO goodness, and the gravy is the writing style. It is extremely easy to digest, yet leaves you full and satisfied. We are only two sections in so far; but, I already understand more about SEO from reading this book than I have learned through any other experience. Juicy Results is my learning institution; and my instructor wrote the textbook! Being the newest Juicer to join the team is a true privilege, one that has already paid off in dividends. I have been welcomed by everyone as a valued part of the team, given equally-valuable constructive praise and criticism, and been excited by every assignment. I am jazzed to go to work every day. So, thank you to Juicy results, and here’s to a long-term adventure of delivering for our clients!